The construction of CASTANEA RESIDENCE started with the first sod and water. A project which architecture is entirely designed by architectural studio CREATIVE. We believe that CASTANEA RESIDENCE will be an excellent example of public-private partnership and an emblem of the Ovcha Kupel district. The building consists of two main buildings - the larger is residential with shops and an underground parking area, the smaller is for the administrative needs of Sofia Municipality, Ovcha Kupel district. Despite the different uses, we have achieved a sense of integrity through the specificity of the main architectural elements and a common line at the ground level. In the residential part there are 40 apartments with various distributions, located on five floors. On the ground floor there are 7 shops and a lobby to the living area. Here you can see the project of "CASTANEA RESIDENCE "
The modern appearance of CASTANEA RESIDENCE is achieved through large volumes, elegant shapes and well-appreciated architectural details that shape a tight and cozy composition. The main color of the building is white to give a sense of purity and sophistication and serves as a canvas to achieve contrast between the rest of the ensemble of different materials such as white limestone, light travertine, granite, metal and glass. 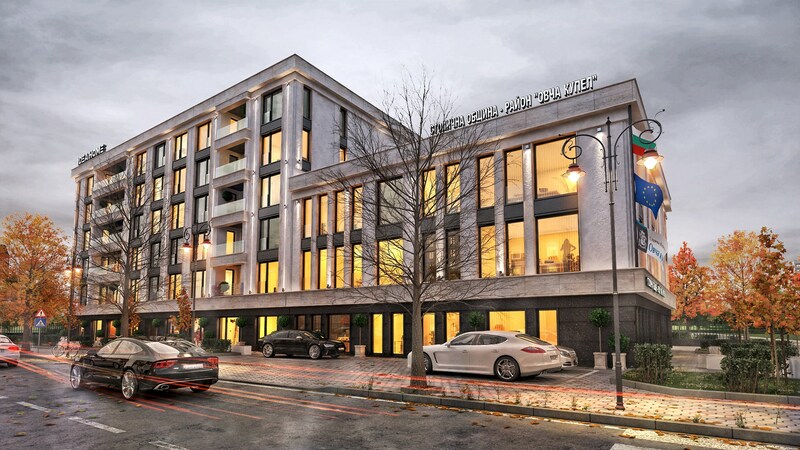 Impeccable architecture, good and communicative location and high-quality performance will make CASTANEA RESIDENCE a unique project on the territory of Ovcha Kupel district, which we believe will leave a memorable impression on the overall appearance of the area. The investment exceeds BGN 4 million and the deadline for completion is September 2020. Below you can see the photos of the event.